A native of Maracaibo, Venezuela, Lali Mejia specializes in the Afro-Venezuelan folklore as well as Latin American and Caribbean styles of music. During her career as a percussionist, Lali has shared the stage with prominent musicians—Marco Granados, Aquiles Baez, Roberto Koch, Jorge Glem and Akira Tana, among others. Additionally, she has participated in numerous music festivals around the U.S, the Caribbean, China and Japan, and performed in venues such as the Tokyo Hakuyu Hall, Macau International Music Festival, Lincoln Center Out of Doors, San Francisco Jazz Festival, Venezuelan Sounds at the Smithsonian Institute and SF Davies Symphony Hall. Since 2004, Lali has helped facilitate many Afro-Venezuelan workshops around the U.S. and internationally and teaches weekly classes in Afro-Venezuelan percussion. In early 2017, Lali —in partnership with Jose Roberto Hernandez decided to form Bululú, a trópico-Venezuelan band focused in bringing uplifting, musically-rich performances, influenced by her Venezuelan and Caribbean roots. Jose Roberto Hernandez is a multi-instrumentalist, singer, composer, arranger, producer, music educator, ethnomusicologist, and of the most respected exponents of folkloric music of Latin America in the U.S. today. He was born in the city of Cardenas (Tabasco), Mexico, where his musical career began and continued in the state of Oaxaca and Mexico City, before relocating to the United States. Surrounded by master folklorists, he rooted his career in traditional music—and discovered this was his greatest passion. His devotion, creativity and professionalism in the genre of traditional music have earned him the recognition of great musicians from Venezuela, Bolivia, Peru, Cuba, Puerto Rico, Brazil, and Argentina. He is known for his innovative use of traditional forms and instruments in combination with contemporary music, and has earned much respect as a musician, singer, composer, and producer. Through the years he has collaborated with renowned masters of Latin music such as Orestes Vilato, John Santos, Jesus Diaz and Bobi Cespedes among others. Jose Roberto is currently endorsed by Godin Guitars, Sarga Percussion, Steph Accessories, Inc., Fishman Transducers, Inc., NS Design, Zemaitis Guitars and Kidam Accessories. Pianist/Composer Ruthie Dineen was born in Fairfield, CA and began playing piano at an early age. During her college years at UC Berkeley (grad. 2004) and while studying abroad in Chile and later living abroad in Costa Rica, music remained central in her life through both study and performance. After completing her graduate studies in Social Work (grad. 2009), Ruthie decided to focus professionally on music performance and community arts (she is currently the Deputy Director of Programs at East Bay Center for the Performing Arts in Richmond, CA). In December 2012, graduated from the California Jazz Conservatory with a performance degree in Jazz Studies, where she received the Jamey Aebersold Scholarship. Currently, Ruthie’s music career is focused on both composition and performance. Ruthie is a founding member and co-leader of two original music ensembles, RDL+ and Negative Press Project, with whom she performs, arranges, and composes regularly. In addition, she performs with a wide range of jazz, latin, and classical musicians in the Bay Area, including vocalist Amie Cota, members of the Amaranth String Quartet, Bululú, and salsa groups N’Rumba, Candela, and Somos el Son. Miguel Govea has performed professionally in the San Francisco Bay Area since 1978. 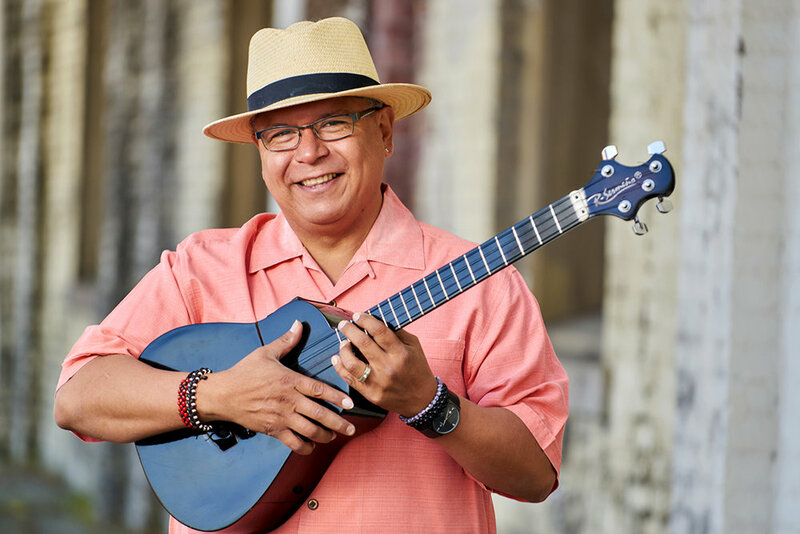 He is a California native of Mexican descent, and has spent much of his musical career playing with many of the luminaries from the Caribbean, Mexico and Latin America who make up the vibrant local Latin music scene. Through his elevated mastery of multiple intruments, Miguel delivers a powerful array of colors and flavors to the ensemble. His own Bay Area bands include Los Peludos, Los Compas and La Familia Peña-Govea. Fernanda Bustamante, vocalist and violinist from Peru, has spent a lifetime performing. She started playing the violin when she was three years old and started singing when she was 10. She trained classically on the violin for 15 years before she entered the world of Latin music, rhythms, and improvisation. There, she discovered her love for traditional and folkloric music and dance. Today she performs with various musical groups around the Bay Area including Bululú, The KTO Project, Jose Roberto and Friends, and Vinic-Kay. She is also an Afro-Peruvian dancer and musician for De Rompe y Raja Cultural Association. Grammy-winning singer and percussionist Omar Ledezma Jr. was born in Caracas, Venezuela. Upon receiving The North American Scholarship to attend the prestigious Berklee College of Music, Omar moved to the United States, where he enjoyed studying music and staying busy in the New York and Boston Latin scene. Omar currently teaches percussion at the SF Community Music Center, the California Jazz Conservatory and in 2016 was a part of the DISC schools program of the prestigious SFBallet. Additionally, he is a founder of the Ka-Hon Ensemble for the San Francisco Symphony's “Adventures in Music” program and a pioneer in promoting Venezuelan music in the United States through his work with major Venezuelan artists Aquiles Baez, Gonzalo Grau and Jackeline Rago. In 2014, Omar won a Grammy for “Best Latin Album” with his recording on the first Pacific Mambo Orchestra album, titled PMO and he is an exclusive endorsee artist with Pearl Percussion and Soultone Cymbals. Peta Robles Izquierdo is one of the few, most accomplished female percussionists of Peru. She was born in Lima into the “Los Izquierdo” family of exceptional musicians and dancers where she began to play cajon and “zapatear” when she was a child. As a young adult, she became the National Champion of Female Percussionists in Peru and has traveled throughout Europe, North and South America as an ambassador of Afro-Peruvian music and dance. Peta is also an educator—a remarkably charismatic and patient percussion and dance teacher for all ages and levels. Lichi Fuentes is a singer, choral director and multi-instrumentalist born in San Fernando, Chile. The youngest of a musical family of 7 brothers and sisters, she came to the Bay Area in 1980. Currently, Lichi is the director of La Peña Community Chorus, a member of Bobi Céspedes Band and Bululú. She has played with prominent Afro Cuban bands such as “Conjunto Cespedes”, Jesus Díaz y su QBA, Chilean group “Grupo Raiz” and founder of the all-women ensemble “Altazor". Lichi has also worked extensively as a music educator in many Bay Area schools throughout the years. Norma was born in Ciudad Ojeda, state of Zulia, Venezuela. She is the 4th sibling of a family of 6, and started singing folkloric music at an early age along with her brothers. By their teenage years the Kansau siblings had founded a church choir in Venezuela and had the opportunity of touring within the country and parts of Europe, earning a number of awards along the way. Norma has been a Bay Area resident for over 20 years now and has participated as a vocalist in musical projects from Perú, Venezuela, and México, and continues to be an integral part of her church choir in Richmond, CA. She fully enjoys collaborating with artists from Latin America always bringing a healthy dose of joy and enthusiasm to her performances which are part of her stamp and sound. Kevin Silveira is a Bay Area native from Portuguese decent. He first started playing Afro-Caribbean music while attending SJSU. From there he has continued learning and playing in the leading Latin orchestras such as Braulio Barrera's Somos el Son, Javier Cabanillas' Cabanijazz Project, Julio Bravo y su orquesta Salsabor, and occasionally along side Louie Romero y su grupo Mazacote, and the Grammy award winning Pacific Mambo Orchestra.